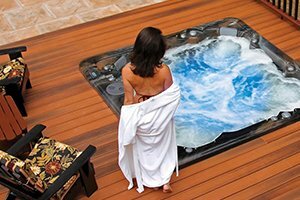 PDC Spas Hot Tub Accessories - Enhancements - Enhance your hot tub relaxation with one of the many accessories PDC Spas has to offer, making your home into a backyard oasis. 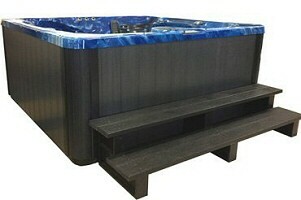 Hot Tub Blue Tooth Audio System - Match your music with your mood to enhance that much needed relaxation experience. SoundStream™ Audio System enables you to wirelessly stream music from any Bluetooth® device. Your entire digital music collection, plus SiriusXM, Pandora internet radio, iTunes, and much more is instantly at your fingertips. All SoundStream™ Audio Systems have been redesigned for an enhanced relaxation experience with two marine grade speakers mounted slightly above the water's surface. With this speaker position and an in-cabinet subwoofer, your favorite tunes float across the massaging waters with unsurpassed clarity, even at the highest volume. With the Allure2™ LED Lighting on all the Luxury Series models, speakers are lit in sync with hot tub lighting. Enjoy SoundStream™ audio during your much deserved downtime for complete relaxation, body and mind. Audio system not available on LifeStyle Series models. An easy to use spa side control panel makes sure that wet fingers never need to touch your audio device. You can also download the free app to control your entertainment vibe from any smart phone or tablet. Convenient, easy operation to complete your relaxation experience. Hot Tub Lighting - Lights are the ambience of relaxation, so set the mood with our unique lighting systems. Each of our hot tub lighting systems enhances your spa atmosphere, illuminating your backyard oasis. Simple convenient fingertip control from your digital control center for a totally encompassing evening of relaxation and comfort. 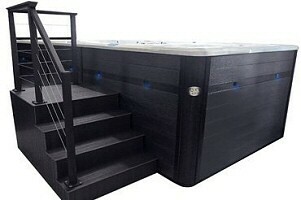 PDC Spas offers 4 types of hot tub spa lighting. Set the warm swirling water aglow with soft color from an underwater LED light. Choose a slow rotating prism of tones or your favorite color that best matches your nighttime relaxation mood. Standard on all LifeStyle™ series hot tubs. Underwater LED lighting with MotionGlow™ Lighting and six pin lights plus two lit cascading water spouts. 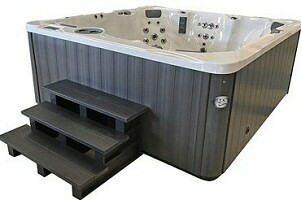 Standard on all Premium series hot tub models. 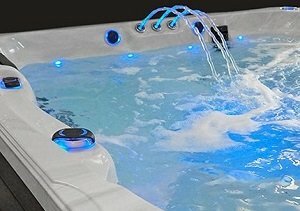 All Luxury Series hot tub models warm your nighttime relaxation with LED underwater pin lights and three lit cascading waterspouts for a tranquil sound and soothing ambiance. 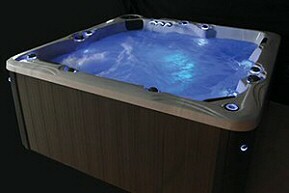 Standard on all Luxury series hot tubs. 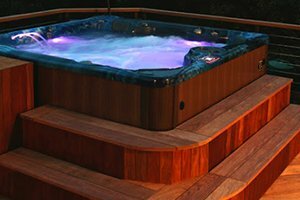 The optimum in hot tub lighting, this optional Luxury Series feature adds LED lit cup holders, air controls, and UltraMassage™controls setting the topside aglow with warm color. Four brilliant LED corner sconces wrap your Luxury spa model in warm light completing your evening relaxation experience. 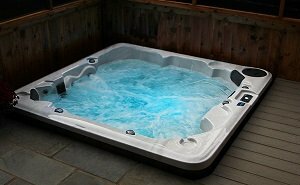 Optional on all Luxury series hot tubs models. Virtually eliminate surface heat loss with our PDC covers. Featuring a full length hinge heat seal, 4” sloped foam core and locking straps, these covers keep your hot tub or swim spa energy efficient and economical to own. ASTM approved. The PDC Premium and LifeStyle Series hot tub models feature our deluxe hot tub cover in PermaWood™ cabinet matching colors, keeping your hot tub operating efficiently and economically. 3 year warranty. Lock in Heat, Lock Out Waterweight. 7 Year Warranty. 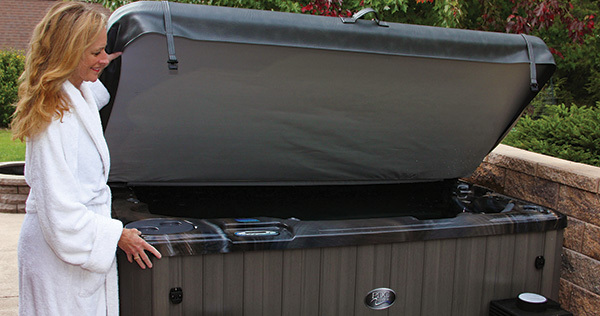 Exclusive to PDC Spas, this hot tub cover, AccuLok™, is unique with a heat-trapping design and water resistant barrier keeping your cover lightweight and easy to use for years longer than the traditional cover design. The insulating foam is heat sealed with a proprietary material that virtually eliminates water vapor absorption. Watch our video for a full explanation of what PDC Spas can offer you other brands can not with this very unique AccuLok™ thermal cover. Backed with a 7 year warranty , AccuLok™ lasts longer, remains lightweight and traps heat like no other cover on the market. Opening and closing of your new hot tub cover is effortless with the black metal Rock-It Cover Lifter. Simple fold the cover in half and the lifter assists in positioning it neatly behind the cabinet. 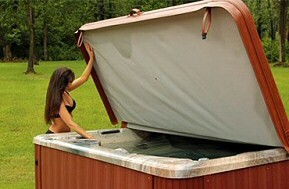 With ease, replace the cover back onto the hot tub, close flat and secure the latches. Swim Spas: See Swim Spa Cover Lifters. Contact us or stop by our amazing spa showroom where we have a great selection of spas on display, the finest saunas, top of the line above ground pools and a large selection of parts, supplies and accessories for al of your needs.